Our experienced team of height safety experts work with you throughout the entire process of designing and installing a height safety system, ensuring that your building is height safety compliant. We are there to work with you from initial audits and inspections, to system design and installation, and finally training. When choosing to work with Workplace Access & Safety we consult with you to develop a clear action plan. This plan provides you with a project timeline including long-term strategies and statutory requirements, and works as a basis for you to gain a true and accurate understanding of your safety system requirement and budgetary costs. We are committed to you for the long-term, so you can be safe in the knowledge that we will ensure that your system provides optimum performance now and for years to come. The starting point for any project is to rate the risks into high, medium and low taking into account the frequency of access and the consequence of an incident using standard risk assessment tools. We identify the current controls and check their compliance to Australian Standards and the Building Code of Australia. Utilising the hierarchy of control we then nominate future controls. 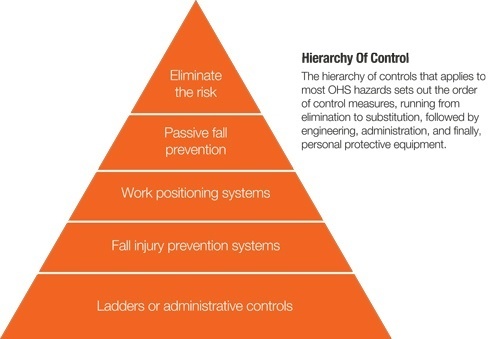 The hierarchy of controls for fall prevention differs significantly from that of other hazards, so it is essential to nominate future controls with reference to the correct hierarchy in order to ensure that the risk assessment is relevant and compliant. 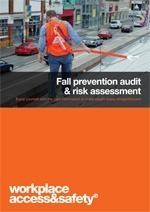 We can audit your site and examine it for compliance with fall prevention regulations and Australian Standards. As part of your risk assessment, it’s essential to check that existing equipment complies to current Australian Standards. Certain Australian Standards are referenced in state based legislation, which means that to comply with legislation, your equipment needs to comply with that specific Australian Standard. We help simplify the budgeting process by providing accurate costings based on your audit, which enable you to understand your specific safety requirements. As part of our on-going consultancy we also offer guidance to the allocation of funds for any ongoing statutory maintenance and training costs as required by both state based and Australian legislation. For example, standards dictate that the inspection and testing of level 3 controls such as roof anchors and static lines are completed annually. Users and their supervisors are also required to complete specialist training on these systems, and administrative controls such as a roof permit system are essential. When budgeting for a fall prevention system, it is important to account for the ongoing costs over the life of the asset to establish the true cost of the control being selected. You need to take into account training requirements, consumables, ongoing maintenance and testing requirements, recertification and cost of maintaining administrative controls when establishing the true cost of a system.